Science helps students develop a sense of wonder about the world around them, fosters an inquiring mind and equips them with the critical thinking skills to inform their own opinions. The Science curriculum at Campbell High is underpinned by a commitment to making science relevant and practical for all students. Course units are developed around the National Curriculum released by the Australian Curriculum, Assessment and Reporting Authority (ACARA). Modules of work incorporate current topics and contain many opportunities to develop deep understandings and practical skills relating to the process of scientific investigation. 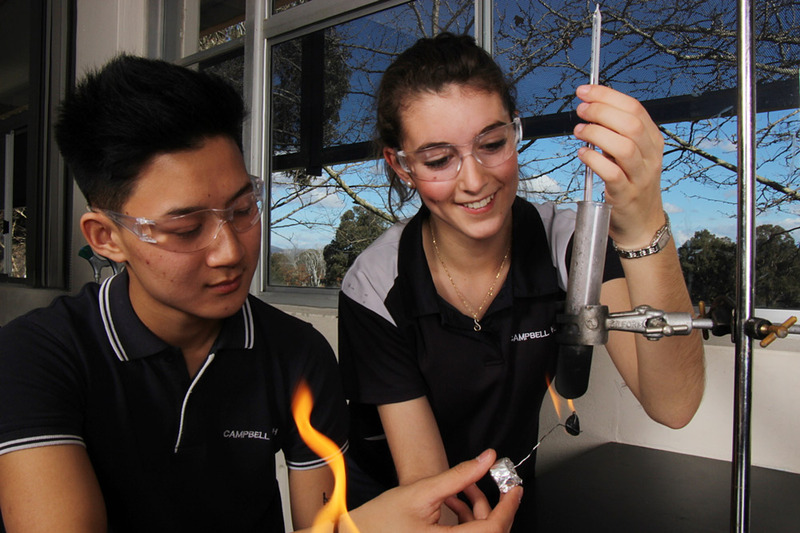 By the end of year 10 students who have successfully completed science programs at Campbell High School will be well prepared for further study in science at college or CIT. Students must all study a core program of science from year 7 to year 10. All classes follow a common course of study with specialised support or extension as required. In years 8, 9 and 10 the science program provides scope for students who have particular strengths and interests in science. Extension opportunities are offered to students who have shown a significant interest in science and have demonstrated a high level of academic achievement in their previous year of study. Students access a wide range of scientific equipment, current texts, computer hardware and software to support and enhance their learning in science. Students also use their Chromebooks or other digital devices to digitally record practical activities and manipulate experiment results into tables and graphs. the science faculty is committed to developing units of work that are based in Google classroom and utilise many of the features of Google-suite (G-suite). Students have opportunities to participate in a number of science competitions such as the Science Challenge, RACI's Australian National Chemistry Quiz and the Big Science Competition. A variety of science enrichment options are offered to encourage student elective participation in chemistry, engineering and science competitions. STEM is an educational approach that incorporates Science, technology, Engineering and Mathematics to guide students learning through the use of Project Based tasks. By adding Art to the equation, STEM transforms into STEAM. Students that are exposed to experiential learning are proven to be better problem solvers, more creative, and develop higher level critical thinking skills. These attributes are essential for all students, in order to meet the needs and expectations of the 21st Century workforce and future careers. STEM is an area that can incorporate a wide array of interests and skills, from developing new technologies to focussing on processes and efficiency in a huge variety of human endeavours. STEM has recently been introduced at Campbell High School as an elective subject for year 9 and 10 students, as well as an enrichment activity available to all students. With the aid of a significant capital works financial contribution from the Education and Training Directorate, Campbell High has converted two science laboratories into a very large STEM facility. The STEM facility is home to a Trotec Speedy 300 Laser Cutter and two MakerBot Z18 3D printers. As students (and staff) learn the ins and outs of these machines they are starting to be utilised in a wide variety of ways to support student projects, from building model car bodies to designing and printing small components that can be used to secure a stylus to student Chromebooks. STEM is an area that will continue to grow at Campbell High as we develop programs that will support many of the cross-curriculum priorities in the Australian Curriculum.